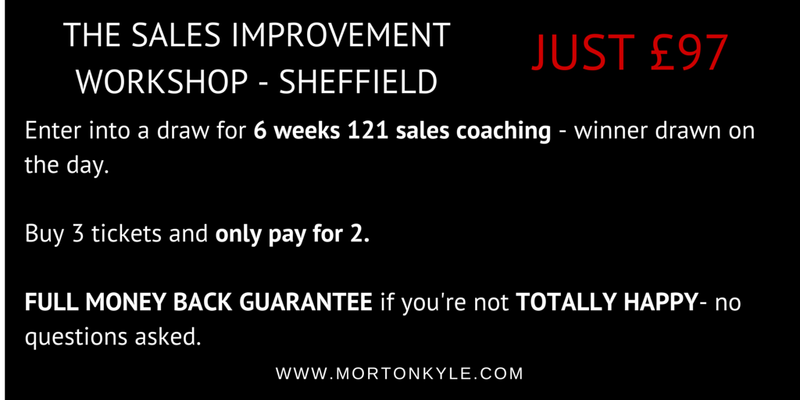 The Sale Improvement Workshop – held in Sheffield, it’s an intensive 1 day sales and business development course. It’s fast, furious and designed to have you thinking differently about your sales and business development efforts, as well as giving you insights and skills that will allow you to immediately boost your sales and business development skills and results. Because I want you to have all the sales and business development skills you need SO YOU CAN WRITE YOUR OWN COMMISSION CHEQUE! All you have to do is hit this link and take control of your own earning potential. Here’s the link: I want to write my own commission check and decide what bonus I get paid this month. Understand this, sales and selling is part art and part science. That means there are formulas for creating success. Formulas that are proven in sales to generate more leads, sales and profitable order than you can imagine. Proven by other great sales people, high achievers, people who never have to worry about making target, hitting minimum thresholds or calculating if they can afford to go on holiday or even have treat at the weekend. These success formulas are available to you. Formulas, which, if you work them, will work for you too. The course is just £97 pp + vat…places fill up fast so reserve your seat today. Why should you attend The Sales Improvement Workshop? Sales has changed so much over the last few years – did you know that most buyers are, on average, 57% though the buying process before they invite suppliers in for the beauty parade? Imagine what that does to your new business development efforts? Buyers fall into two very distinct camps at the moment – transactional and relational – knowing the difference will increase your close rates and your profits – would you recognise the two different types of buyers and if your did, would you know how they should be sold to so you maximise your conversion and your profits? Are you in a competitive industry? Here’s a clue…every business is in a competitive industry…so how to you use that to your advantage? If you’ve ever legally wanted to kill your competitor…. Then you need to attend The Sales Improvement Workshop. It’s just £97 + vat, and one day – to change how you think about Sales and Business Development for ever. The Sales Improvement Workshop Sheffield can also be delivered as an in-house course which can be tailored to meet your very specific sales and business development needs. Simply call me to discuss.